Saulecker, full, fat, yet velvety, noble, far too fast all! Thank you for the gift, and because gift -> also no Preisgefasel of me. sehr reife und intensive Nase, weich, rund und alt, schon in der Nase fühlt man das Fass und den alten Sherry, herb und süß eine gute Kombination, macht Lust ihn zu probieren, sonnenreife Aprikose und Rosinen, etwas Salz mit dem Flashback an Austern und Sommer, süß wie eine französische Aprikosen Tarte. in langer Erinnerung bleibt ein herb süßes Fass das edel daher kommt . "Dusty" it hits at the beginning. Dusty and aged with dignity, like an old cherrywood secretary. Behind it intense fruity. Dark fruit, somewhat exotic and intense sherry, creamy and backed with a mixture of spices, caramel, herbs (or mulled wine sweets) and leather, bound in milk chocolate. Intensive. Again, intense fruity. Dark fruit, orange marmalade, sherry, mulled wine and caramel. Behind it again herbs and spices, leather, some oak, polish and tobacco. 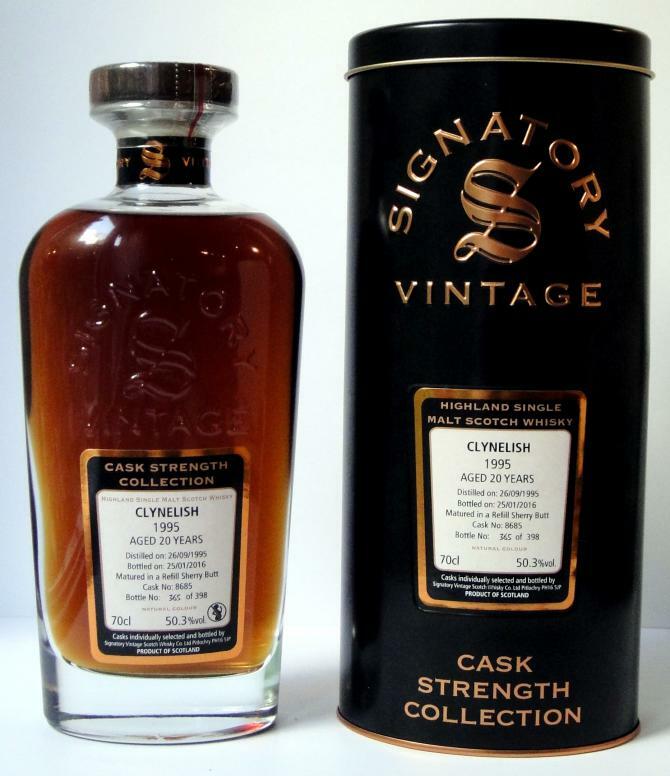 The alcohol gives the dram strength and intensity, but is very well integrated. Long and lingering. Espresso, chocolate, orange zest and sherry. This is really a fantastic cask - all well balanced with lots of aromas and perfect level of woodiness and sweetness. We have a winner! Heavy, sweet, dried fruits, plums, prunes, dates, but also apricots, cooked oranges, brown sugar, and very good notes of oak wood - fantastic! Punchy, very oily and creamy, great notes of oak wood, truck loads of dried fruits, sweet and sticky, some toffee, hints of fresh citrus fruits such as oranges - excellent! Refill Sherry at its best. 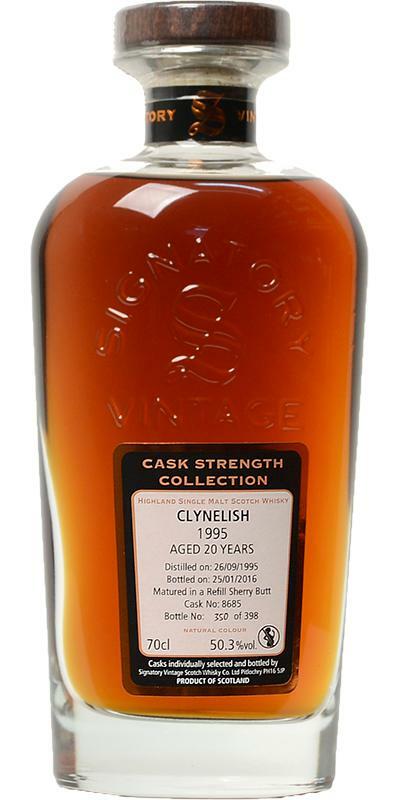 Very nice interaction between Clynelish notes and the sherry influence. Wow, a whisky that has a lot to tell. 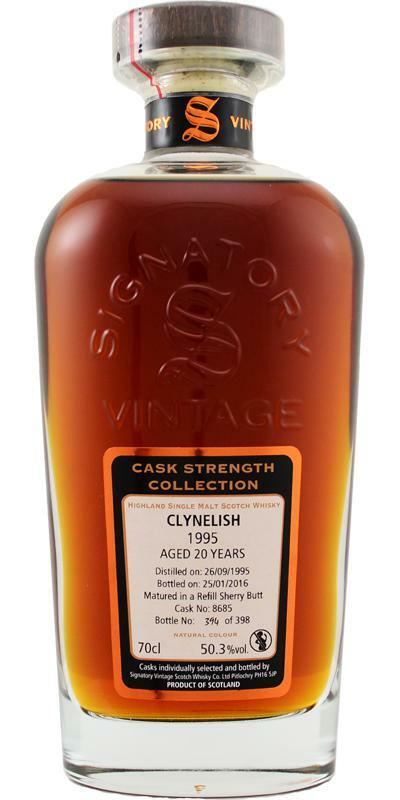 A terrific single cask. Uh, a very intense nose, dark and sherry-shaped. But in no way overloaded, but "noble", "time-honored" and matured in wisdom. Dark berries full, deep red ripe grapes, raisins, dates, a leather set from the 19th century. The sweetness of the fruits is not intrusive, but is beautifully captured by the leather and oak flavors. A hint of cinnamon and brown sugar comes, beeswax (of course) as well. Intensive cocoa and chocolate notes at the beginning. Mon Cherie - taste without the bitterness of dark chocolate. Strong in the approach, oily, velvety, a lot of old oak (but without bitterness), biscuits with orange gel filling. Wild berries. As such, the alcohol is only warming, perfectly integrated. Candle wax and brown sugar. After the first sip, the beeswax aroma is intensified in the nose. Remains long, very long silky and oily on the tongue. Almost like molasses, the whisky dresses the mouth. Slowly then show fine herbs, which mix beautifully with the dark berries. Long with a lot of sherry on the tongue, pleasant oak, cocoa and milk chocolate. Color copper red. Goes under the X-ray scanner into brownish. From the nose I had typed out of the bottle on a port wine finish (maybe influenced by the slightly brownish color). He then smells much fruity from the glass. Now I would rather tap on sherry keg. Cooling nose, oak is there, but also a bit biting. Cask strength! On the palate, then pretty sweet, prickles on the tongue. Jop - Sherryfass and Cask Strength are already logged in! High proportion of oak, which in turn speaks for a smooth age in the European Oloroso. Maybe it's too fruity for PX ... but it's always sherry. Even tap full maturation and single cask. Dark chocolate, sherry, seasoning - aaah this seasoning on my cheeks is already awesome! Now join oranges, even a small bitterness, or orange peel to it and the finish a pleasant wooden character. After 2-3 minutes then a bit Mon Cheri Piedmont cherry ..
Land becomes tame quickly with water. The spiciness then decreases a lot. I prefer him pure, knowing that he probably has around 55 turns. The age I guess 19 years. Distillery is always hard, guess what, and tell Benriach Speyside. 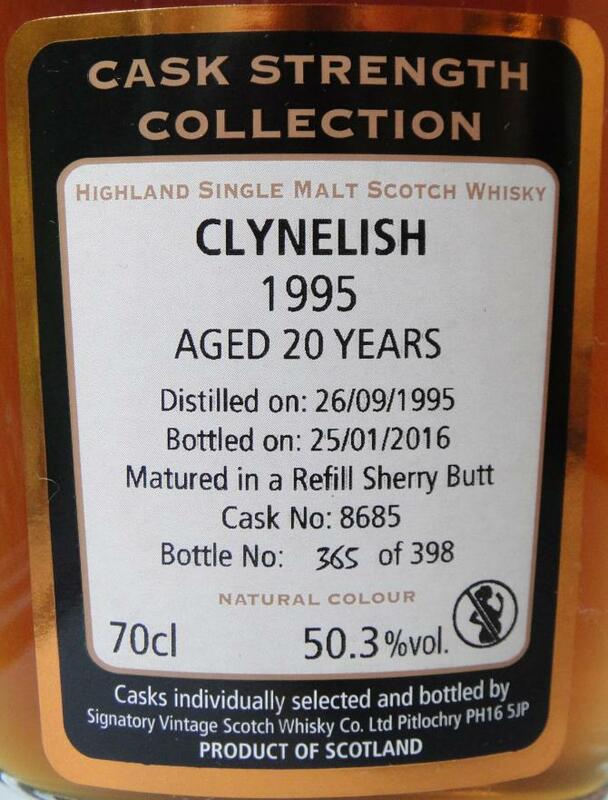 out for Clynelish and Glenlivet in particular. Thumbs up Signatory! influence and letting the distillery character shine through just long enough!